Hey everyone! Roree here with today’s Make It Monday post and I have some fun products from the Latest & Greatest workshops to share with you. Our next show is this week in Akron, OH on October 5th & 6th. 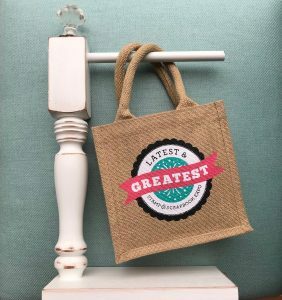 Stamp & Scrapbook Expo will be teaching four “Latest & Greatest” workshops at this show: Card Making, Cool Tools, Scrapbooking, and Stamping. 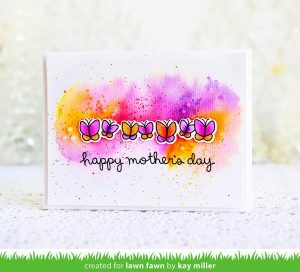 Today I am sharing a project I created with products from our Latest & Greatest: Card Making class: Moxy Glitter from American Crafts. It includes a Moxy Glitter Shaker Set, Clear Stickers, and Glitter Funnel & Brush set. In the Glitter Shaker Set, there are two extra-fine glitters, two fine glitters, and two chunky glitters in six different jewel-tone colors. 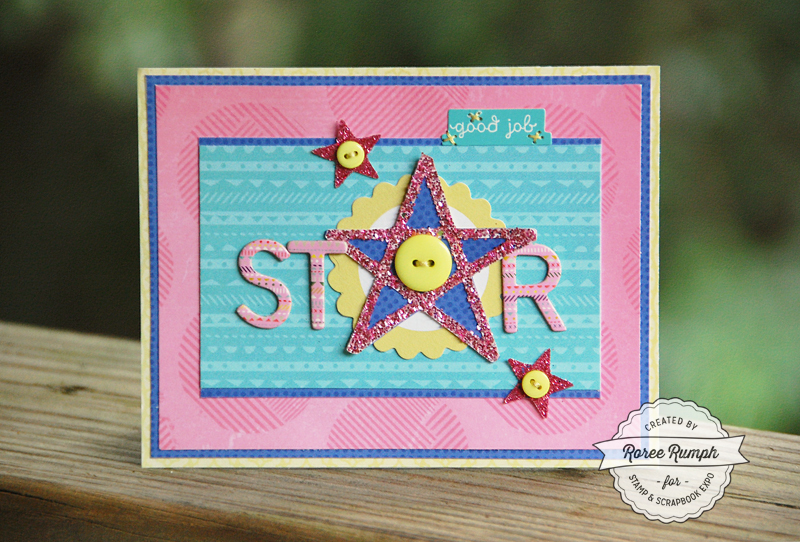 I chose the pink fine glitter to cover the large star sticker and the darker pink extra-fine glitter to cover the small star stickers. I covered each of the stickers in the Glitter Funnel which made clean up very easy. 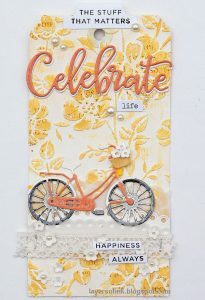 I paired the stickers with papers and embellishments from Pink Paislee‘s Turn the Page collection and Vicki Boutin‘s All the Good Things collection to finish this fun, colorful, and sparkly card. 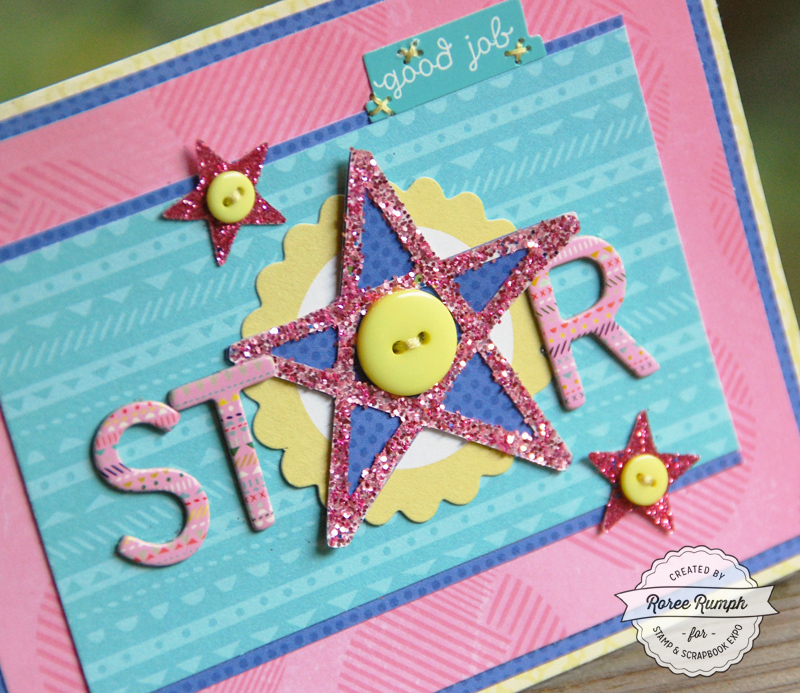 This Latest & Greatest: Card Making workshop featuring Moxy Glitter from American Crafts will also be taught at our upcoming shows in Sacramento and Ontario. We would love to see you there! I hope you enjoyed today’s Make It Monday project. Thanks so much for stopping by! This entry was posted in Card Making, General Crafts, Latest & Greatest, Make It Monday, Manufacturers, New Releases, Paper Crafts, Stamp & Scrapbook Expo and tagged all the good things collection, American Crafts, buttons, Card, Card making, Clear Stickers, die-cut, glitter funnel and brush set, glitter shaker set, Latest & Greatest, moxy glitter, Patterned Paper, pink paisley, Roree Rumph, Stamp & Scrapbook Expo, stickers, stitching, turn the page collection, Vicki Boutin. Woot Woot – See you in Sacramento!